I love toddler clothes, but sometimes it can get pretty pricey, especially with shoes. I feel like my son is one size for a hot minute and then he quickly outgrows his size. Luckily, my husband is just as much as a budget shopper as I am, and he's always finding the best deals. Just a few weeks ago he bought Andres Sebastian this Oscar de la Renta striped shirt from Gilt.com for just under $25 bucks. It was originally $80! It was such a great deal he ended up buying two of them (one in pink and one in navy). Gilt.com has some really great deals on brand names for boys and girls. Another one of my favorite places to shop for brand names is T.J. Maxx and Marshalls. 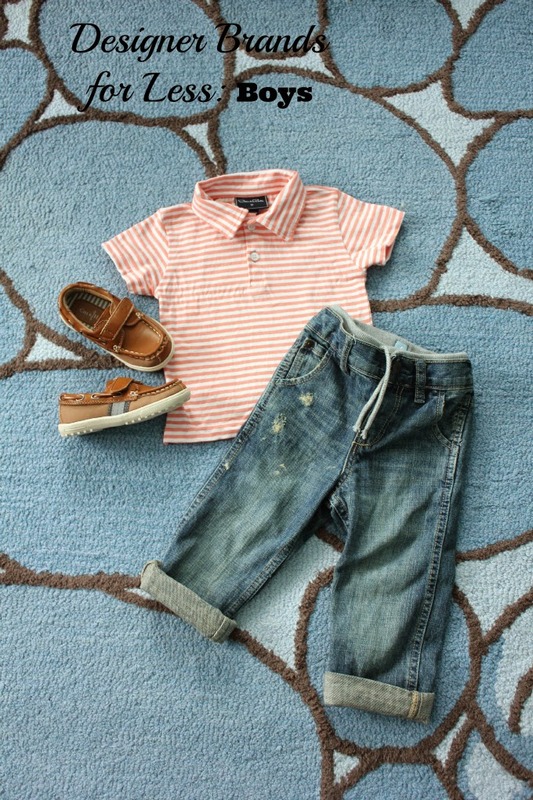 They have the BEST boy clothes and shoes. The other day I spotted these Cole Haan toddler shoes for just $20 bucks. Can you believe it? They only had them in a size 8 and although Andres is a size 7, I just couldn't pass them up. 1. Gilt.com: You can find high-end brand name clothes at great prices. My husband is subscribed to their email alerts, so he knows when there's a good sale coming up. 2. Zulily.com: Similar to Gilt, this is a flash sales site that also has good deals. They aren't as upscale as Gilt, but you can still find brands such TOMS and good prices for your everyday basics. 3. J.Crew Factory Store: J.Crew has adorable toddler clothes that start at 2T. Instead of shopping at the regular store, I like to check out their Factory store. 4. Baby Gap Outlet Store: The Baby Gap Outlet store has amazing deals. The other day I bought about 5 t-shirts, a pair of pajamas and shorts all for under $30 bucks. You can also check out the sales section at the regular Baby Gap stores. 5. Old Navy: Old Navy is owned by Gap and many times have the same great quality and styles you'd find at Baby Gap but for way lower. 6. Marshalls: Here you can find the same designer brands you'd find at department stores but for 60% less. I've found some great brands such as Ralph Lauren for my son. I especially love their shoe department. 7. T.J. Maxx: Here you can also find designer brands for less. The key is to always go back often, because they're constantly getting new merchandise. What are some of your favorite places to shop for baby or toddler clothes?